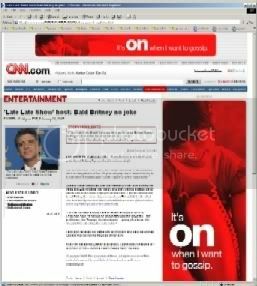 Looking at CNN today, I could not but help to notice the ad's for Verizon as they were all over the freaking page. 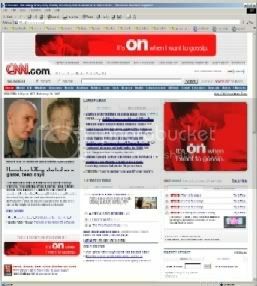 There were only 3 ads on the CNN homepage, and they were all flash-based ads which made them distracting as hell. I really think that someone in CNN and/or Verizon's adverting department really does not get it. Just cus you have the the same ad more then once on a page, does not mean you are going to get more sales. It just means you are spending more money. So I find a story I want to read even with the sea of red flashing ad's all over the place. So that page opens and what do I see, more Verizon ads, and one was a freaking huge ad too. By the way, that is not the way to get on my good side. I already have no use for Verizon since I have seen how they treat there coperate customers, and now they are hitting me with very big and bright red flashing ad's. Mind you all of these screen captures that I have done came off my system at work where I have a 21" flat panel and I run 1600X1200 screen resolution. These ads were huge even for my settings which really makes everything really small on my monitor. This is what a lot of people do not get about ads on the web. First they think bigger is better. They think they need to be in bright colors and flash. Um, WRONG! If anything it just means that I turn my self off from that company. Also CNN is not doing them self’s any service here too. As much as I love CNN, if they keep this crap up, I might just go somewhere else for my news needs. Also, why do they feel the need to show me the same add on every freaking page and I mean every page. Even the quick poll's had the Verizon ad on it. Now, I could not even tell you what they are selling here. Really I can not, and I had to watch the ad's many times to get the screen captures that I wanted on many different pages. So that really should be a measure of how well their ads are working, or not working for that matter. If you work in advertising, take notes of what the consumer wants, not what you think we want, or even what you want. And no, if you work for a company, you are not a consumer even if you use that product and/or the services of the company you work for. Even my ISP (EarthLink) has yet to figure this out. I pay good money for my DSL account, and yet, I still have to deal with banner ads in my webmail? Um, hello, if I pay for the service, I do not want to deal with ads no matter what. That is why I love LiveJournal. I have a paid account here at LiveJournal which gets me many things, but what it also does is allow me to see almost no ad's anywhere on the site. The only place I have to deal with an ad is on the LJ homepage when I am signed out. When I am signed in and viewing the LJ homepage (or anywhere else on the site), no ad's at all. Also, my paid accounts means that people who view my blog here at LiveJournal do not have to put up with ad's on my blog. I even tested it just to make sure I was correct. Here is a company that gets it for the most part. Yes, I would love to figure out a way to not see any ad's on the homepage, even when I am signed out, but such is life I guess.